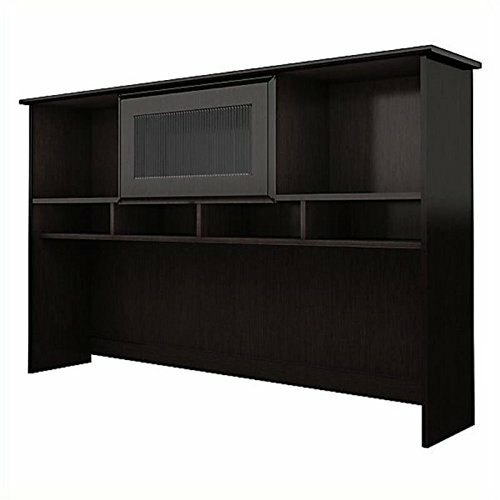 The Collection 60" Hutch adds additional storage space to the Collection 60" L-Desk or the 60" Corner Desk. Available in Espresso Oak finish, the Hutch offers simple, elegant styling with contemporary touches like flip-open doors on storage space, wire management system, and open work-in-process bays to keep you organized. Features: Finish: Espresso Oak; Material: Manufactured Wood; Application: Commercial; Cable Management: Yes; Fits Collection 60" desks; Flip-open door on closed storage space; Work-in-Progress trays to keep your desktop organized. Specifications: Overall Product Dimensions: 30.25" H x 31.5" W x 19.75" D; Overall Product Weight: 63 lbs; Manufacturer's Warranty: 1 year.